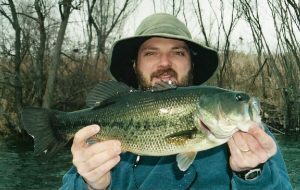 This bass comes from the days when my lipless crankbait of choice was the Rapala Rattlin’ Rap. 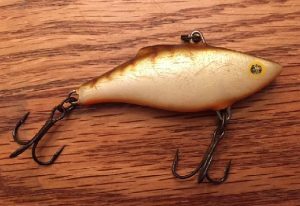 Nowadays I lean more towards the Strike King Red Eye Shad but I did once again have that old Rapala bait in tow just about a year ago during a tribute to an old Major League ballplayer. 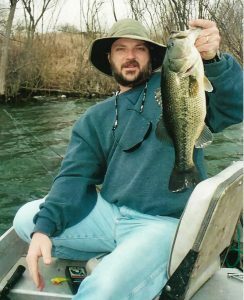 However, it did not get into the lineup as another Rapala bait, the Fat Rap, scored on that day. After you finish today’s flashback post I encourage you to click here for the “Le Grande Orange” post to read all about last year’s outing and a nod to the late Rusty Staub. But I’m off on a tangent here as the aim today is to go back just a little farther than last year. Yep, we’re going all the way back to when I was just a husband. At the time of this fishing trip it was just me and Julie as parenthood was still 98 days away. I asked one of our boys, Jayce, what was different about Dad in the picture? His reply, “Your beard, it’s not gray.” Right on the money, that’s the answer I was looking for. I then asked, what was different about Mom and Dad’s life fifteen years ago? Yep, right again, young man. He wasn’t sure if there was a correlation between those answers but I suspect this bunch of youngsters has at least contributed in some manner. 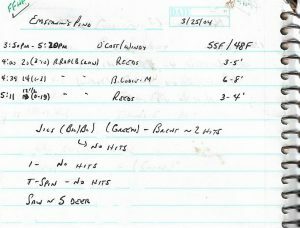 March 25 – Shortly after arriving home from work, the phone rang. All Brent had to say was, “I’m over at Mom and Dad’s.” I interpreted the statement as an invitation to hit Emstrom’s and asked my wife for permission. A half an hour later I clamped down on the lip of a 3-10 bass that had both trebles of a Rattlin’ Rap (brown craw) stuck firmly in the side of its mouth. We fished for around an hour and a half and I caught our other two fish on the same lure with one weighing 1-3 and one 0-13. It sure was nice of Brent to invite me fishing and row me around the lake on the windy day. Water temperature was 48 F with overcast skies and 55 F air temperature. Jigs, spinnerbaits and crankbaits produced a couple of missed strikes. One final note as I close is that it is cool to see myself in the back of the boat and as referenced in the above report that means that Brent was on the oars. Gotta dig that on a windy day on an old favorite farm pond. Over the years I suppose that I returned the favor and paid my dues in taking one for the team.